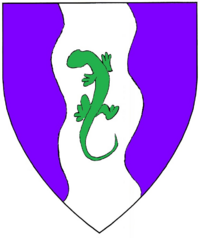 Purpure, on a pale wavy argent a lizard tergiant vert. Anastasia da Monte is an active fencer, herald, and embroiderer, and dabbles in archery and lifting heavy things for royalty. She joined the SCA in earnest in 2009. Anastasia is from Venice in the late 16th century. She and her compatriots Lottieri Malocchio and Dionisio da Desio banded together to create a gang known as The Handsome Boys. The Handsome Boys have grown significantly in that time, and many Crowns of the East have learned to harness their sword skills to be sent at their enemies. This page was last edited on 9 September 2018, at 19:19.